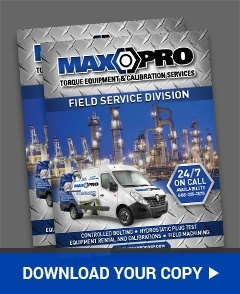 The team at Maxpro understands the importance of flange joint integrity and plant reliability. However, a leaking joint or loss of joint integrity can lead to catastrophic consequences such as loss of asset due to fire, contamination of the environment and even loss of life. Our technicians are trained to ensure all flanges have the correct hardware, proper lubrication & surface finish and the required bolt load to minimize the chance for leaks during the critical start-up phase. BOLTRIGHT PRO is an innovative, bolted joint integrity software program, designed to assist our technicians & customers, with the assurance of accurate bolt load calculations, based on key input data, related to each specific bolted joint. BOLTRIGHT PRO has been primarily designed for use in the Oil & Gas industry, where the safe movement of hydrocarbons in a leak free environment is critical, however it can also assist in many other industries, where bolted joints are present. Each completed flange will come with a Joint Tightening Report (JTR) detailing all available data about the joint including; flange size, material and rating, gasket type, bolt size and material grade, lubricant type and operating temperature.